Changi Airport has always been one of our favourite destination. We can easily spend half a day at the airport exploring the many sights and sounds within the three terminals. 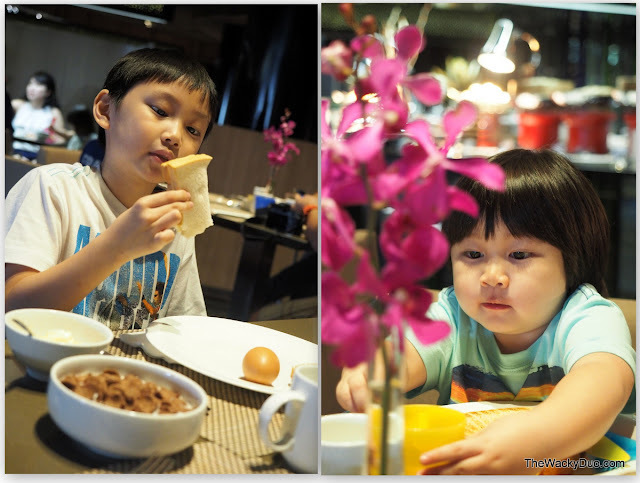 Recently during our visit to Indonesia: The World Next Door exhibit, we were invited to a breakfast treat at Crown Plaza Changi Airport. Being fans of Changi Airport, we have dined in the numerous dining options in the airport. However this would be the first time we would be savoring a taste of Changi at the Azur@Crowne Plaza. Getting to Crowne Plaza was a mystery for the boys. Unlike the rest of the airport decor, the Crowne Plaza is clad in mysterious hues of black. Azur on the other hand, as it's name suggest is clothe in hues of purplish blue. Morning breakfast was buffet style. Azur serves both western and eastern fare for its breakfast . Food are freshly prepared as witness from its show kitchen concept where we witness chefs whipping up the delights for the day. On the East end are familiar dishes such as porridge, parta and dim sum. Prepared in small portions, it ensures freshness and quality for the diners. There is also a confectionary corner comprising of sweet pastries and cakes. For the health conscious , cereals and juices are also on the menu. The slightly dark sitting area provide an intimate breakfast experience. You do not feel like you are in a rush while dining at the restaurant. It may actually be a bad thing if you are catching a flight straight after breakfast. Compare to the hustle and bustle of dining at the airport restaurants, the option of dining at Azur would defiantly make the traveller feel relax before the trip. To make the deal even sweeter, Azur is having a promotion for breakfast for locals. Show your Singaporean identity cards and 2 children dine free for every one paying adult. ( up to four children). This is a good reason to bring your children and the nieces / nephews for a little hearty family breakfast.